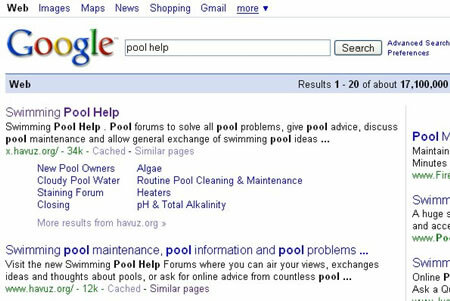 The Swimming Pool Help Forums have been elevated to authority status by Google. With over 17 million 200 million 1,04 trillion results for pool help, the forums have been given special directory status with a list of Swimming Pool Forum site links. Well done guys! You should be proud of your achievements. Coming in second is Swimming Pool Maintenance, an undisputible authority on swimming pool care and swimming pools. It looks like you lucky people are in for a busy summer with a Google thumbs-up like that. Keep up the good work.